After a relaxing 9-hour flight on a surprisingly empty plane, and a week to re-adjust to the UTC-0700 time zone, I am finally back home in the Pacific Northwest of the United States and ready to record all of the happenings of Day 2 of the BizTalk Summit in London. This post has been delayed as I have been without my Surface Pro since arriving home — the power adapter was destroyed in transit. If you haven’t already read codit’s write-up of day 2, I highly recommend giving that a read as well so that you can get a few different perspectives. The morning started off with back-to-back sessions from fellow Integration MVPs, beginning with Steef-Jan Wiggers who demonstrated how BizTalk Server 2013 R2 can be used to implement hybrid integration solutions (without relying on things that are currently in preview). To get a flavor of his demo, you can check out his sample code here, and a wiki write-up over here. Ultimately, his session was a refreshing look at how we can deal with present challenges using presently available software. I stole this image from the BizTalk 360 photo stream on Facebook because it looked really serious and epic, until you catch the background. It just goes to show that a good sense of humor really is something to be treasured when dealing with the insane world of integration. Johan Hedberg took the stage next to walk through how he was able to take one integration from 17s all the way down to 0.95s, and how one might apply the same optimizations. Optimize persistence points, providing a 0.05s improvement at this point. I really enjoyed his talk, mainly because I’ve been through these things while beating integrations into shape to eek out the last little bit of raw performance, and it was nice to see the process all laid out and broken down in terms of numbers gained at each step. If you want to see the talk for yourself, he gave the talk again as part of an #IntegrationMonday talk. 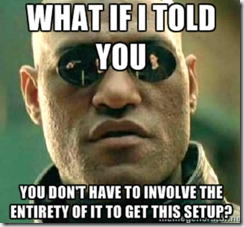 Tip #1 – Trying to annoy Tord: PowerShell! Sandro started by weaving a tale involving famed commercial actor turned BizTalk Administrator Tord Glad Nordahl. In this tale, a developer unwittingly annoyed their BizTalk Administrator with mindless EventLog entries written out for every single event and action that occurred during normal processing. Rather than requiring code to change, or bad habits to die, the smart BizTalk Administrator used PowerShell to clean up and redirect the entries to a dedicated log. The script behind the legend is now available for download. Tip #2 – What RosettaNet, ESB, and UDDI have in common? They’re backed by databases that aren’t backed up by default. The second tip is then to ensure that these are included in your BizTalk backups. Tip #4 – WCF-SAP Adapter supports 64-bit? Yes. 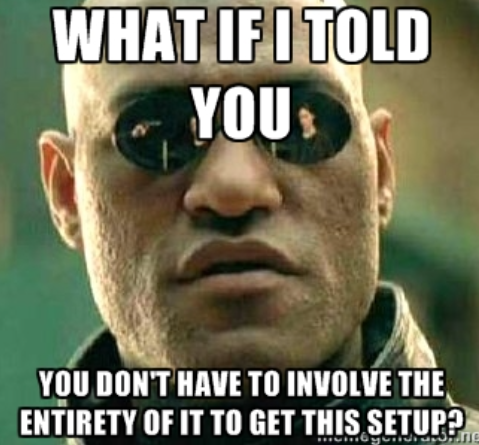 Just make sure that you install all the pre-reqs correctly, and you’ll be set. If, as an administrator, you’re receiving MSI packages from your developers with full tracking enabled all over the place within the application, don’t fret, but instead take control of your environment by automating the tracking settings (again using PowerShell). To combine tips 6 and 7, if you’re doing XML Validation, XML Debatching, FF Decoding, etc… You may not need to create a pipeline per-message type. Instead creating a generic pipeline and setting the properties in the BizTalk Server Administration console (rather than inside Visual Studio) can save you some heartache and suffering. You don’t need orchestrations to use LOB Adapters (but you do need to promote BTS.Operation property for action mapping on the send side). One thing that I liked here, was that rather than creating a pipeline component that by code or configuration “hard-coded” an action in for the BTS.Operation, the solution presented guessed it from the root node of the message – pretty smart. This is actually one of the things that I used to demo in the BizTalk Server Developer Immersion class if the question was ever posed, and one of the things that is now directly included as part of the core materials for the BizTalk Server Developer Deep Dive class. Yes, I am being shameless with those plugs, because I love our new Deep Dive class. This is one of those things that provides a real Take the Red Pill moment when you show it to a BizTalk Developer who has been doing it the hard way for a few years. Here is where my notes start to break down. I typed “custom pipeline components” but what follows are notes about custom functoid development. So either I missed a tip, or I mistyped. I will retain it as written here, and leave it up for you to determine. So what was the tip in my notes? If you’re building out a custom functoid (see what I mean? ), create custom inline functoids whenever possible. This will avoid the need to deploy a bunch of runtime artifacts, since the script itself is inlined in the map. Beautiful, and excellent tip with which to end the talk. Tord was next to the stage for his 30 minute tour of Power BI. I think he introduced it in the right way – at least I felt like it addressed where I was at with the technology. I’ve always been scared of BI, probably unnecessarily – ever since that defining moment as a young developer being exposed to the horror that was a raw, naked, MDX query. When I saw Power BI demoed for the first time, it looked amazing and absolutely incredible – with MDX queries hidden behind plain English, pretty graphs leaping off of dash boards. It looked great. Because it looked great, and computers aren’t really magic, that must mean that there is hard work and lots of technologies to learn behind the scenes, right? That was the angle that Tord took, as even he was looking at it skeptically, thinking there was going to be a lot of stuff to learn just to get started. However, during his talk, he proved that this wasn’t the case, and showed just how easy it really can be to get up and running with Power BI. So where’s the BizTalk tie-in? He was using Power BI against data gathered by BAM, because it really is just data in a database at the end of the day. A really beautiful way to tie it all together (and certainly more modern looking than the BAM portal). For me it’s a personal treat to be able to hear Charles Young speak, and luckily I got the opportunity at the 2015 BizTalk Summit in London. He’s the Donald Knuth of EAI, and always serves to bring the larger picture to developers (myself included) who tend to have myopic tendencies driven by the lust for shiny things. So how would he introduce himself? “I am an EAI dinosaur. I’ve been doing it for years, and years, and years, and we either evolve, or obviously we atrophy or whatever”. Of course, we all know what whatever is. Poor dinos (except for the raptors in Jurassic Park – they had it coming). His talk walked through the evolution from n-tier architectures of the 90’s to Alistair Cockburn’s Hexagonal Architecture (to which BizTalk Server closely aligns, and shares terminology with, though pre-dating the architecture), all the way through Microservices Architecture. As he expanded out to iPaaS and Microservices, he mentioned that he has a problem with most of the iPaaS platforms today (e.g., MABS), where the full integration / mediation workflow is emitted up to the cloud as a monolithic thing which makes no proper separation of concerns (e.g., Itinerary containing a bridge with VETR flow). However, with App Service, he sees a change of direction in which we don’t have to use Logic Apps, for example, to use API Apps – the capabilities are no longer tightly coupled to the workflow. I must admit, his session was so packed full of essential and incredible content, that I was unable to take notes fast enough to capture it all. He doesn’t waste a lot of words, and still succeeds to use lots of them. If you want a better view into his brain right now, as he’s processing the change in the industry, read through his latest series of posts on architecture (Part 1, Part 2, Part 3). Next up was Jon Fancy and Dan Probert, to completely blow my mind. 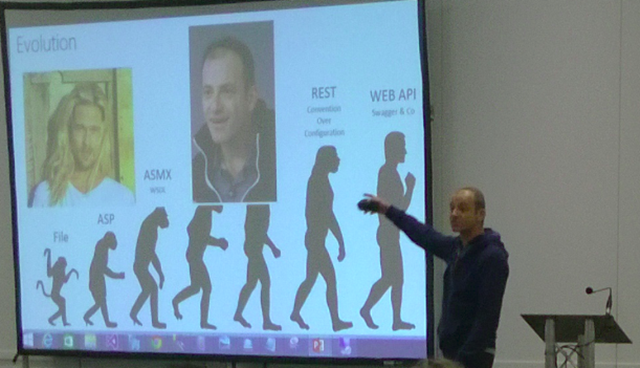 At first, it seemed that their talk was going to be providing tips to migrate BizTalk solutions to Azure App Service. Instead they announced that they had created an automated service to do just that. I thought it was a joke. I thought they were going to have a fake announcement, and then resolve it with, “of course, automated migration will never be possible, so here’s a checklist that you will need to manually go through”. But this was not the case. Indeed, they were announcing, and DEMONSTRATED a working migration service that was able to take a BizTalk Server application and migrate it over to Logic App form on Azure App Service. Good show! I was so thrown off by this that I couldn’t get my camera up fast enough and ended up with some wonderful candid pictures of my shirt, my shoes, and the floor. Best of all, you can sign-up today. I’m still in shock over this one. The next set of talks were a coordinated effort between Kent Weare and Tomasso Groenendijk. Kent followed through with a nice end to end demo of API Management being applied to a car insurance purchasing scenario with a shiny Windows Store app front-end. I always get excited when I see Tomasso, because I know that I’m in the same room as one of the few human beings that shares the same passion for the ESB Toolkit as I. He’s also probably the only person I know who has ever implemented IExtenderStyle (so rare, it’s not even Google-able, though Bing makes an effort) – that shows that he really takes pride in his work. He demonstrated what it looks like to put API management in front of the ESB Toolkit on-premises, which adds the benefit of message repair thanks to the ESB Exception Management Framework. For an added bonus he demonstrated the message repair being done through the BizTalk360 ESB Portal. Power BI to replacing the BAM Portal, and BizTalk360 to replacing the ESB Portal demoed in the same day to the same audience? Yes! I’m really looking forward to seeing more modern looking front-ends for BizTalk installations in the wild as a result. Nino closed out the conference with his talk on his own personal journey as a developer that led to the thing that is currently eating up his free development time – JitGate. From there he set out to use the tools provided by Azure to build out an integration framework that gave him those same benefits. The result was JitGate – Just-in-time integration. So does this mean he’s announcing an App Service killer? Not necessarily. It means that Azure is an enabler. It has the power as a platform to do integration, and to handle insane loads. You don’t have to use Microsoft’s solution for doing it, you can use the same technologies that they’re using and build your own that is just as capable. In a way, this is similar to what we had with BizTalk Server – built on top of .NET since 2004. .NET and SQL were always available to any developer who wanted to build something similar to BizTalk. I don’t want to minimize what Nino has built here though. It is truly impressive and something that sadly, I can’t really capture here. It’s one of those things that you have to see demoed. Stay tuned to his blog for a post with full details and a video of it in action. Well it looks like Microsoft has announced Azure Service Fabric, which appears to be a re-branding of Azure Pack and promises to bring the world of Azure App Service on-premises. There are certainly exciting times ahead. I’ll be at Build 2015 next week in San Francisco, CA to learn all that I can about that, and then the following week will be back in Kirkland, WA teaching the first run of our Cloud-Based Integration Using Azure App Service class. I hope to see some of you along the way, and if you’re going to the BizTalk Boot Camp 2015 event, y’all better tweet everything so I can get a glimpse of it too!